I did it. I finally broke down and did it. I ordered from Sportlots. Ever so often, a blogger talks about getting this or that from Sportlots, and I would roam over, look at a few things, but never really pull the trigger. But recently, I had reason to make a purchase. More later. Now, I didn't go big. My cart did have over 100 cards in it at one time, but I had to do this purchase on the cheap - there was one card in my cart that needed to be purchased before it disappeared. 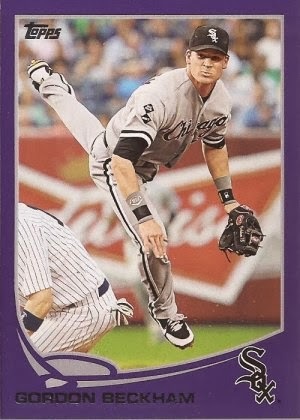 I had only seen this card one other time, at 3 times the price it was listed at Sportlots. A price difference like that is a no brainer. I still had to maximize my purchase, shipping-wise, and wish I could have gotten 5 cards instead of 4, but the final card that got voted off is one I can find fairly easily on the site. Here are the three that made the trip in the envelope. 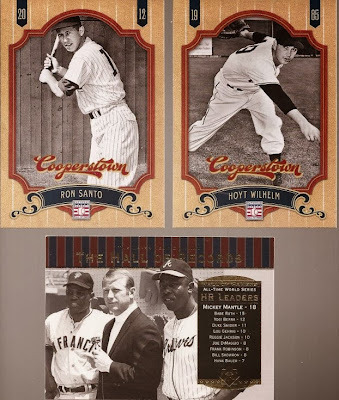 The final two base cards for the 2012 Panini Cooperstown, so it's nice to mostly have that set complete. And the Aaron at the bottom leaves me just one card (#1 in fact) to mostly finish the first set ever added to the Want list here at 2x3 Heroes. It was the other card (Jackson) that missed the cut. But why did I finally take the plunge at Sportlots? COMC is the only other place I have seen this parallel. This card set me back a buck. That brings the rainbow total to 8 cards. I have seen the gold, cammo and silver slate on eBay, so I should be able to slowly pull those in. Oh, the vintage you'll get! Repack Wars: HEAD TO HEAD! It's getting hard to do my job. How I play the game.